Katie is the President of the Louisiana Market for JPMorgan Chase and Managing Director of the J.P. Morgan Private Bank in Louisiana. Prior to beginning her current role in 2008, she served as a Banker on the team for eight years. 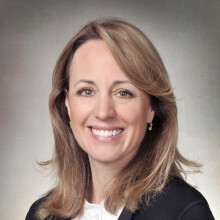 She began her banking career with a predecessor to J.P. Morgan in 1996. Katie is active in the community and makes volunteer work a priority. She is the past Chairman and a current board member of Junior Achievement of Greater New Orleans, past chair and a current board mem ber of the Louisiana Young Presidents Organization, and has served on the board of Boys Town Louisiana, the Louisiana Childrens Museum, and the GNO, Inc. Public Policy committee. After completing her undergraduate degree at Ohio University in Athens, Ohio, she went on to earn a MBA from Tulane University’s A. B. Freeman School of Business. Katie holds NASD Licenses: Series 7 , 66, 9, 10 and 24. Katie resides in New Orleans with her husband, Wendell, and their three children, Estelle, 12, Ace, 10, and Gigi 5.